Last Wednesday WOJ started a new challenge. No one ever gets tired of loving! Godt det gikk bra med deg og din datter i bilbrannen. Huff...en skremmende opplevelse! What an adorable pumpkin image and so beautifully colored. Thanks for playing along with the Simply Create Too challenge no. 47, Fall/Autumn. Eine wundervolle Karte. Danke für deine Teilnahme bei SsC. Hab herzlichen Dank für Deine Teilnahme bei der Stempelsonne. Gorgeous card, love the image..Thanks for playing along with us at Totally Papercrafts this week. What a adorable card! Love the cute image! Thanks for joining us at “Simply Create Too”, hope to see you next time again. Karin: So glad you joined in our "Fall/Autumn" Challenge #47 and hope you enter often. 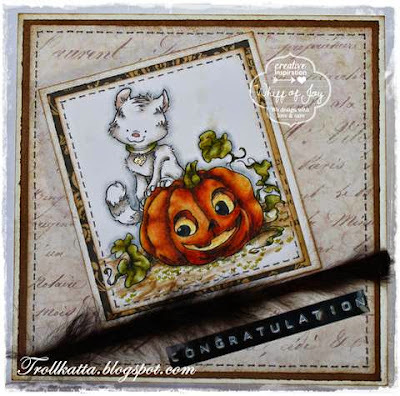 Your card is so cute--love the fall colors. Beautiful card! I am so sorry to hear about your car fire. Thanks for playing along with us at CAS-ual Fridays! Wonderful card, super sweet image! Fabulous card and love the vintage image! Thanks for sharing at TPC this week. Your coloring is awesome! what a great take on the code word!